36-year-old Youtube personality Coyote Peterson is a married man. Coyote has a daughter Pup Peterson. Pup is just like her father and travels with him sometimes. Know about Coyote Peterson. 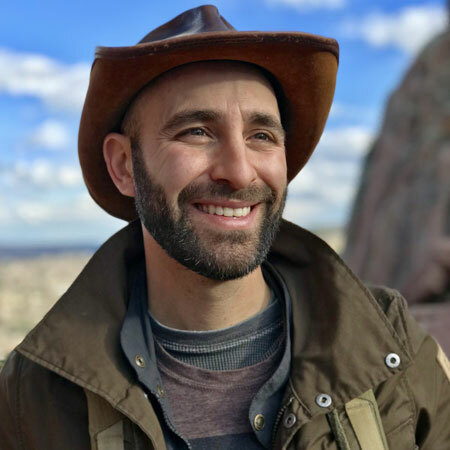 Following the footsteps of Steve Irvin and Bear Grylls, Coyote Peterson is an Emmy Award-winning personality who has amassed huge fan following on his channel as brilliant wildlife educator and specialist. His fans pretty much know about him professionally but what about his love life? Is he committed or already married? Scroll down to find out. Is YouTube Personality Coyote Peterson Married? The brave animal expert Coyote Peterson is a married man. Yes! the handsome TV personality is certainly off the market. The 38-year-old YouTuber is very secretive about his personal life. He has not been seen or spotted anywhere with his beloved wife. He shares a daughter named Pup Peterson born in 2008 who has appeared on several of his videos helping his father as a host and learning different things. His daughter is just as fearless as him. If there is one thing that is guaranteed to make Pup smile... its Horned Lizards! Coyote is very much active on his Instagram and his daughter can be seen on his Instagram following in his footsteps. She is studying different species under her father's supervision and is an animal lover just like him. The YouTuber is enjoying his professional life but it's really hard to know about his love life as he is very low-key about his personal life. He can be seen in many events and programs but keeps a sealed lip about his family life. Landing Dragons in Texas with @mario_aldecoa On the track of a 200 lb legend and so far we have caught his two smaller cousins. Stay tuned... this might be one epic episode of Dragon Tails if we can pull it off! The personality is not hesitant when it comes to his daughter but information about his beloved wife is not disclosed. Peterson debuted on his YouTube channel from a video titled 'Breaking Trail-Trailer' which was a minute-long video introduction to the series 'Breaking Trails' and was very much appreciated by the wildlife lovers. Following the success, he began uploading videos every week and his third video crossed over a million views. One of his videos where he gets stung by a cow killer wasp which is known to be second-most painful sting crossed over 39 million views. One of his cameramen was also attacked by a giant alligator which honestly became his biggest selling point and his channel grew at a rapid pace. He also received an Emmy Award for his series 'Breaking Trails'. Full body shot of the beast! This Spiny tailed Iguana is the largest lizard I have ever captured, he was so cool! This is going to be a great episode, it took us several days to finally catch one, and we couldn't have asked for a more handsome specimen! The personality spends most of his time traveling to several places and he aims to travel to every country in the world shooting videos and learning about several species of animals. Born on September 1, 1980, in Newbury, Ohio. His birth name is Nathaniel Peterson. He studied film at the Ohio State University. Wrote a book Coyote Peterson's Brave Adventures: Wild Animals in a Wild World. His videos have more than a billion views. He stands at the height of 5 feet 11 inches and weighs about 66 kgs. Some of his popular shows include Beyond the Tide, Dragon Tails, Base Camp, Breaking Trail, Base Camp featuring in different locations in Australia, South Africa, Australia, and the United States. Net worth is estimated to be $2 million.